WE IMPORT THESE SO PLEASE CALL US ON THE NUMBER BELOW IF YOU REQUIRE MORE AT A REDUCED RATE!! Dried mealworms are a great and simple way to provide a high calorie, high protein treat for a wide range of wild birds in the garden and are a particular favourite of Robins and Blackbirds. 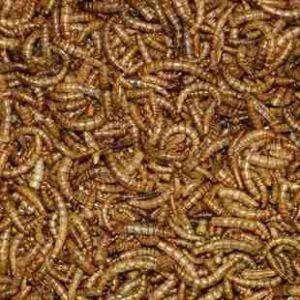 They have several advantages over live mealworms, some people are a little reluctant to handle live grubs, they can be kept in storage for much longer and, ideally, should be soaked in a little water overnight to rehydrate them to appeal even more to wild birds. Feed from a specialist mealworm feeder, sprinkle on the ground, on bird tables or mix with other foods for a protein boost. Reptiles, chickens, large pond fish and garden visitors like hedgehogs will all find these a wholesome and nutritious treat.